Barking were knocked out of the FA Cup in the Preliminary Round at the hands of fellow Bostik North side Bowers & Pitsea. Jamie Dicks scored to put Bowers in front during the first half and that’s how the score remained. Barking failed to get a foothold in the first half but mainly restricted Bowers to half chances and long range shots. As the half progressed Bowers were getting closer and closer to breaking the deadlock and took an expected lead after 37 minutes as Quentin Monville’s cross to the far post was headed back across goal by Lewis Manor for Jamie Dicks to hook the ball home. The second half was much of the same with Barking struggling to create chances and Bowers looking dangerous without particularly challenging Otuyo in the Barking goal. 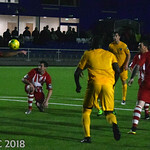 The introduction of Rashid Kamara and Darelle Russell did bring a fresh impetus to the Barking attack but it took until the final kick of the ball for Barking to go close as Darelle Russell launched himself at Ricky Tarbards cross but he could only head over from close range.